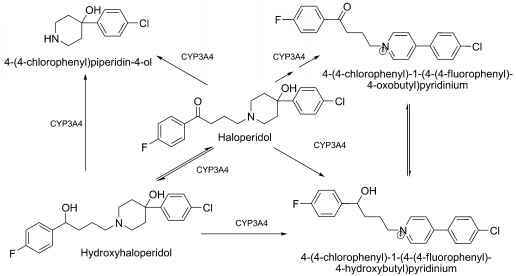 Figure 17.15 • Effect of pH on inhibition of cholinesterase by physostigmine and neostigmine. Solutions of physostigmine salicylate are incompatible with the usual reagents that precipitate alkaloids (alkalies) and with iron salts. Incompatibility also occurs with benzal-konium chloride and related wetting agents because of the salicylate ion. Physostigmine Sulfate, USP. Physostigmine sulfate occurs as a white, odorless, microcrystalline powder that is deliquescent in moist air. It is soluble in water (1:4), alcohol (1:0.4), and ether (1:1,200). It has the advantage over the salicylate salt of being compatible in solution with benza-lkonium chloride and related compounds. 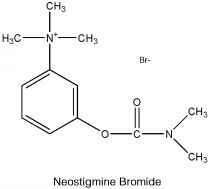 Neostigmine Bromide. Neostigmine bromide, (m-hy-droxyphenyl)trimethylammonium bromide dimethylcarba-mate or the dimethylcarbamic ester of 3-hydroxyphenyl-trimethylammonium bromide (Prostigmin bromide), is used as an antidote to nondepolarizing neuromuscular blocking drugs and in the treatment of myasthenia gravis. It occurs as a bitter, odorless, white, crystalline powder. It is soluble in water and alcohol. The crystals are much less hygroscopic than those of neostigmine methylsulfate and thus may be used in tablets. Solutions are stable and may be sterilized by boiling. Aqueous solutions are neutral to litmus. Neostigmine has a half-life of about 50 minutes after oral or intravenous administration. About 80% of a single intramuscular dose is excreted in the urine within 24 hours; approximately 40% is excreted unchanged, and the remainder is excreted as metabolites. Of the neostigmine that reaches the liver, 98% is metabolized in 10 minutes to 3-hydroxy-phenyltrimethyl ammonium, which has activity similar to, but weaker than, neostigmine. Its transfer from plasma to liver cells and then to bile is probably passive. Because cellular membranes permit the passage of plasma proteins synthesized in the liver into the bloodstream through capillary walls or lymphatic vessels, they may not present a barrier to the diffusion of quaternary amines such as neostigmine. The rapid hepatic metabolism of neostigmine may provide a downhill gradient for the continual diffusion of this compound.57 A certain amount is hydrolyzed slowly by plasma cholinesterase. 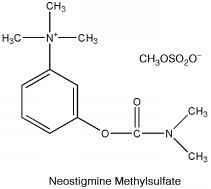 Neostigmine has a mechanism of action quite similar to that of physostigmine. It effectively inhibits cholinesterase at about 10—6 M concentration. Its activity does not vary with pH, and at all ranges it exhibits similar cationic properties (Fig. 17.15). Skeletal muscle is also stimulated by neostigmine, a property that physostigmine does not have. The uses of neostigmine are similar to those of physostigmine but differ in exhibiting greater miotic activity, fewer and less unpleasant local and systemic manifestations, and greater chemical stability. The most frequent application of neostig-mine is to prevent atony of the intestinal, skeletal, and bladder musculature. An important use is in the treatment of myasthe-nia gravis, a condition caused by an autoimmune mechanism that requires an increase in ACh concentration in the neuro-muscular junction to sustain normal muscular activity. Neostigmine Methylsulfate. Neostigmine methylsulfate, (m-hydroxyphenyl)trimethylammonium methylsulfate dimethylcarbamate or the dimethylcarbamic ester of 3-hydro-xyphenyltrimethylammonium methylsulfate (Prostigmin methylsulfate), is a bitter, odorless, white, crystalline powder. It is very soluble in water and soluble in alcohol. Solutions are stable and can be sterilized by boiling. The compound is too hygroscopic for use in a solid form and thus is always used as an injection. Aqueous solutions are neutral to litmus. The methylsulfate salt is used postoperatively as a urinary stimulant and in the diagnosis and treatment of myas-thenia gravis. Pyridostigmine Bromide, USP. Pyridostigmine bromide, 3-hydroxy-1-methylpyridinium bromide dimethylcarbamate or pyridostigmine bromide (Mestinon), occurs as a white, hygroscopic, crystalline powder with an agreeable, characteristic odor. It is freely soluble in water, alcohol, and chloroform. 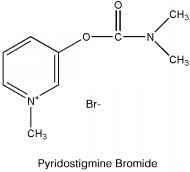 Pyridostigmine bromide is about one fifth as toxic as neostigmine. It appears to function in a manner similar to that of neostigmine and is the most widely used anti-cholinesterase agent for treating myasthenia gravis. 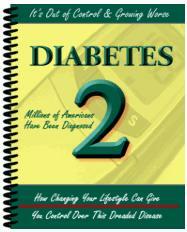 The liver enzymes and plasma cholinesterase metabolize the drug. The principal metabolite is 3-hydroxy-n-methylpyri-dinium. Orally administered pyridostigmine has a half-life of 90 minutes and a duration of action of between 3 and 6 hours. Ambenonium Chloride. Ambenonium chloride, [oxa-lylbis(iminoethylene)]bis[(o-chlorobenzyl)diethylammo-nium] dichloride (Mytelase chloride), is a white, odorless powder, soluble in water and alcohol, slightly soluble in chloroform, and practically insoluble in ether and acetone. Ambenonium chloride is used for the treatment of myasthe-nia gravis in patients who do not respond satisfactorily to neostigmine or pyridostigmine. This drug acts by suppressing the activity of AChE. It possesses a relatively prolonged duration of action and causes fewer side effects in the GI tract than the other anticholinesterase agents. The dosage requirements vary considerably, and the dosage must be individualized according to the response and tolerance of the patient. Because of its quaternary ammonium structure, ambenonium chloride is absorbed poorly from the GI tract. In moderate doses, the drug does not cross the blood-brain barrier. Ambenonium chloride is not hydrolyzed by cholinesterases. 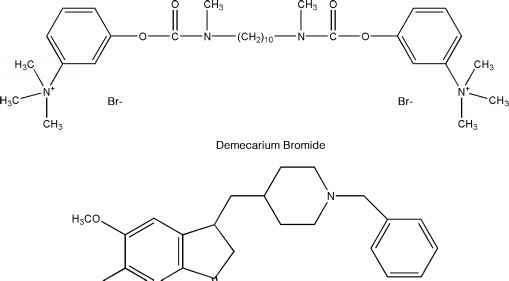 Demecarium Bromide, USP. Demecarium bromide, (m-hydroxyphenyl)trimethylammonium bromide, decame-thylenebis[methylcarbamate] (Humorsol), is the diester of (m-hydroxyphenyl)trimethylammonium bromide with de-camethylene-bis-(methylcarbamic acid) and thus is comparable to a bis-prostigmine molecule. It occurs as a slightly hygroscopic powder that is freely soluble in water or alcohol. Ophthalmic solutions of the drug have a pH of 5 to 7.5. Aqueous solutions are stable and may be sterilized by heat. Its efficacy and toxicity are comparable to those of other potent anticholinesterase inhibitor drugs. It is a long-acting miotic used to treat wide-angle glaucoma and accommodative esotropia. Maximal effect occurs hours after administration, and the effect may persist for days.